Francis Bitonti didn’t just envision a future where everyone can print their own clothes, he created it. Together with students from his “New Skins: Computational Design for Fashion” workshop, the architect-turned-designer devised a couture dress that’s free to download on Thingiverse.com, complete with detailed instructions on how to adapt it to your specific tastes. The “Bristle” prototype, which Bitonti and company constructed using two MakerBot Replicator 2 Desktop 3D Printers, will be on display at the Makerbot’s retail store in New York City in April. To create the dress, Bitonti employed different techniques designed to create volume through three-dimensional printing. Bristle’s upper half comprises MakerBot’s corn-derived PLA Filament, that was chosen for its translucency. The skirt, which Bitonti lined with synthetic fur, uses Flexible Filament, a biodegradable, plant-based fiber that remains pliable even after it’s extruded from the machine. “I see technology as deeply connected to being human,” Bitonti says. 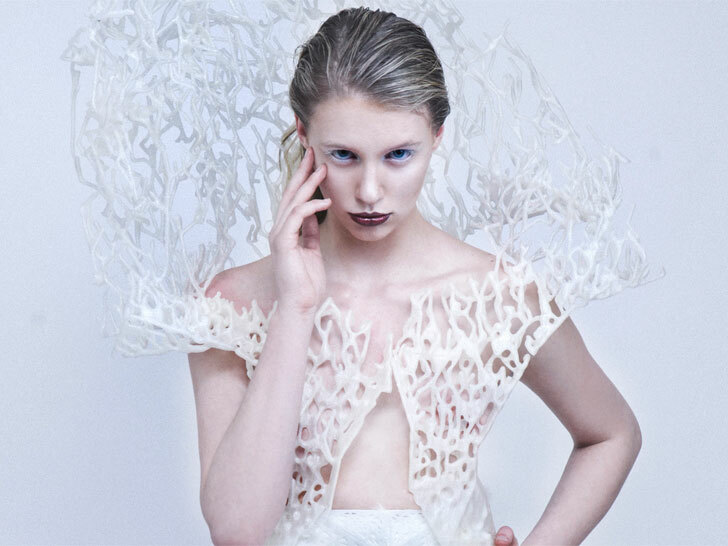 This isn’t Bitonti’s first 3D-printed dress. In 2013, he created a curve-hugging gown, modeled by burlesque artist Dita von Teese, that consisted of thousands of nylon chain links and more than 13,000 Swarovski crystals. “I see technology as deeply connected to being human,” he explains. Francis Bitonti didn't just envision a future where everyone can print their own clothes, he created it. Together with students from his "New Skins: Computational Design for Fashion" workshop, the architect-turned-designer devised a couture dress that's free to download on Thingiverse.com, complete with detailed instructions on how to adapt it to your specific tastes. The "Bristle" prototype, which Bitonti and company constructed using two MakerBot Replicator 2 Desktop 3D Printers, will be on display at the Makerbot's retail store in New York City in April.